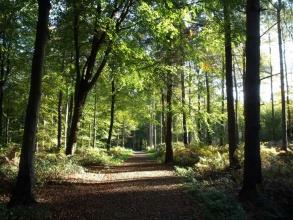 Beacon Hill Country Park0116 305 5000work Country ParkEnjoy magnificent views, woodland walks, and open heathland. Discover the rhododendron labyrinth and the many unique wooden sculptures. Learn how sheep, protected by alpacas, and cattle help maintain the heathland. Visit the new children’s play area near the lower car park and discover the hazel maze and log train in the Natural Play Area. Enjoy magnificent views, woodland walks, and open heathland. Discover the rhododendron labyrinth and the many unique wooden sculptures. Learn how sheep, protected by alpacas, and cattle help maintain the heathland. ‘Pay on Exit’ machines are installed at Beacon which provide visitors with options for the following range of charges depending on their length of visit. Woodhouse Eaves near Loughborough. Off the B5350 between Loughborough and Copt Oak. Take the A50 from Leicester. Bus services: 54, 121, 123. Visit the adjacent Broombriggs Farm trails, Windmill Hill viewpoint, and nearby Jubilee Wood.